The most common reason for marine oil pollution is invariably due to a ship being damaged by grounding or collision. The sight of oil pouring from the torn hull of a ship is something the world has witnessed too often and provokes a sense of helplessness among witnesses unable to stem the flow. Yet once the initial outpouring has subsided and the damage caused by the pollution rectified at great cost, large volumes of hydrocarbons can still remain trapped within the sunken vessel. These can become discharged intermittently by wave action or through movement of the wreck so that it remains an ongoing source of pollution, often for years after the original incident. 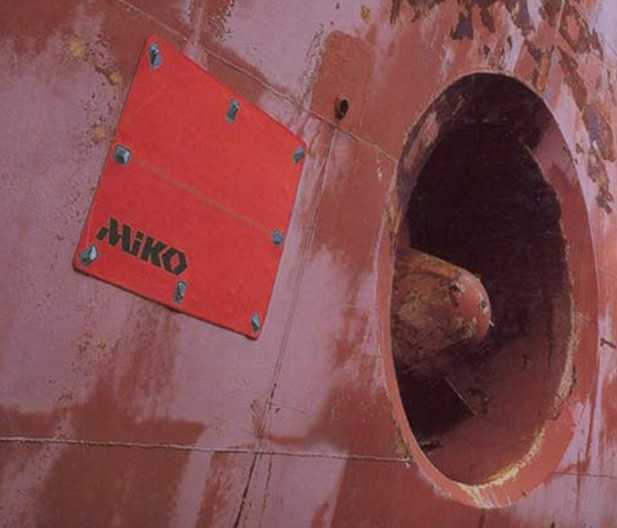 Magnetic or flexible patches can now be used to prevent more leakage and Miko Marine AS of Oslo has often seen its products deployed with considerable effect when they have been responsible for minimising pollution and also for preventing the total loss of the vessel. Miko is now well known for its range of flexible magnetic patches that have saved coastlines from oil pollution on several occasions. However, the threat of a different type of pollution was averted in 2010 when a nuclear fuel carrier began taking-in water as it sailed south from Murmansk. It was a small leak caused by a defective valve but the flooding of its engine room was unstoppable. Fortunately all Norwegian Coastguard vessels are equipped with Miko magnetic patches and these were used to seal the leak so the ship could be escorted to a port for permanent repair. Had the patch not been available the ship might have been lost with frightening consequences. It took several years of careful research to develop magnetic patches suitable for such tasks. The patch must achieve a powerful bond despite what may be many layers of paint or corrosion keeping it from the metal. This has been accomplished by mixing rare earth particles with an exceptionally strong blend of Nitrile rubber. With a stretch strength of 9000 N per 5 cm it means that such a strip of the fabric is capable of lifting a car and is therefore more than adequate for most repair applications. When the rare earth particles are mechanically rolled together with the rubber they are distributed in parallel lines. After they are magnetised they consequently become intensely powerful and this necessitated further research to identify a rubber compound strong enough to prevent the migration of the magnetic particles yet soft enough to achieve a good seal. A finished patch will weigh 10 kgs per square metre so an additional layer of material is laminated to the patch to provide buoyancy. With lifting lugs also fitted during manufacture it can be easily manoeuvred into position under water by divers. Once in place the powerful magnetic bond can, if desired, be reinforced by additional magnets to create a dependable water tight seal that will enable interior compartments to be pumped dry or the dangers of further oil leakage to be eliminated. If the ship’s damage has created an uneven surface that makes magnetic patches unsuitable, Miko’s flexible patches can be used with equal effect. These are manufactured from a high strength fabric that combines polyester reinforced PVC with aramid. It is made like a shallow bag with a brim that is held securely against the hull by flexible aluminium strips that are fixed in position by divers using a powerful underwater stapling tool. The bag-like capacity of the patch enables it to cover any irregular tearing of the hull while the stapled brim ensures a strong and watertight seal. The benefits of Miko patches were demonstrated in the Norwegian fishing port of Vadsø when a flexible patch was used to repair the trawler m/v Nybo when it was in danger of sinking after a collision. Two magnetic patches enabled the trawler’s hold to be pumped dry and most of its valuable catch to be saved. Within six hours a flexible patch had been delivered by Miko and fitted over the damage so that the boat could then sail to a repair yard. After some internal reinforcement repairs the trawler was considered seaworthy and allowed to resume work. This was an important cash bonus for the family-owned boat which was able to continue trawling in Arctic waters for three weeks with the Miko patch in place before going to a dry dock for permanent repair when the season closed. When slow, difficult and expensive underwater welding is often the only alternative repair option, Miko magnetic and flexible patches are now becoming seen as the most practical and cost effective answer to some of the oceans’ major pollution hazards.